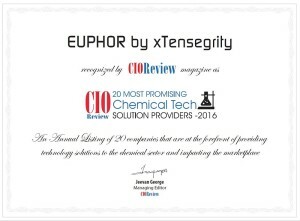 Hamilton, NJ, February 19, 2016 – EUPHOR by xTensegrity makes it to CIOReview’s top Chemical Tech Solution Providers list for its expertise in helping customers to enhance productivity by ensuring that strategic compliance functions work faster, cheaper and better. The annual list showcases the 20 Most Promising Chemical Tech Solutions for 2016. The positioning is based on the evaluation of xTensegrity’s specialties in conceptualizing,architecting and implementing innovative solutions like EUPHOR allowing customers to transform complex regulatory processes into opportunities for enhanced compliance management and to take their business to the next level. The annual list of companies is selected by a panel of experts and members of CIO Review’s editorial board to recognize and promote Technology Entrepreneurship. EUPHOR by xTensegrity has been selected after being evaluated across more than a dozen quantitative and qualitative elements. Experts have made the decision by taking into consideration xTensegrity’s experience in delivering innovation software solutions to their clients, industry recognition, technical certifications, market presence and positive client reviews. CIOReview constantly endeavors to identify “The Best” in a variety of areas important to tech business. Through nominations and consultations with industry leaders, its editors choose the best in different domains. Chemical Tech Solution Special Edition is an annual listing of 20 Most Promising Chemical Tech Solution Providers 2016 in the U.S.